Foof has made these delicious bar cookies for as long as I can remember. They are so good freshly baked but also remain delicious when cooled. Of course in our household they never make it too long past freshly baked! Use a 9×15 baking pan. Mix butter and sugars until fluffy, add eggs and mix well. Add flour, baking powder and salt to butter mixture and mix well. Divide the batter in two equal halves. Mix cocoa powder with one half of the batter. 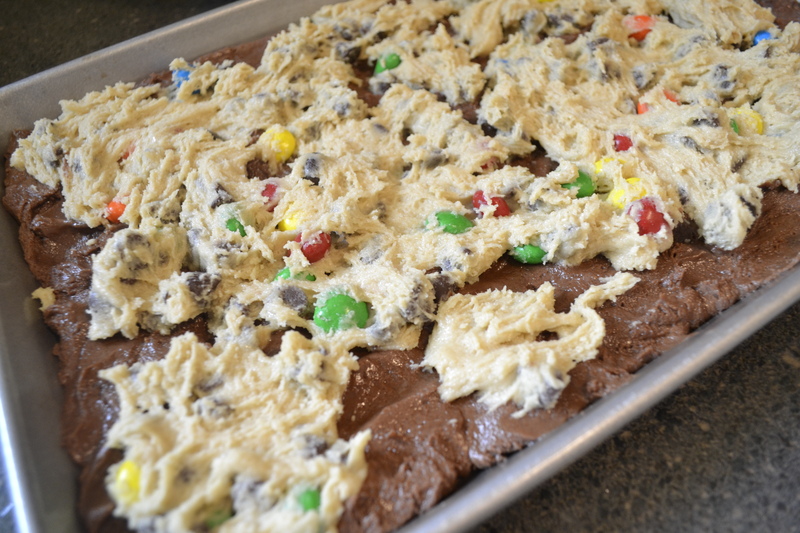 In the other half of batter mix 1 pack of plain M&Ms and 1 cup of chocolate chips. Spread chocolate half of dough onto pan, dot with the candy dough. Spread as well as you can. Sprinkle remaining candy on top. Bake for 30 minutes or until done.